Wow! Wow! and Wow! What a pleasant surprise to have this recipe, along with the cauliflower “rice,” come out so good. Juli from PaleOMG really outdid herself with this recipe. I did change it up just a tad because I don’t like overly spicy foods but feel free to add the sriracha which I didn’t add. Let’s look at the ingredients that are used. There’s actually two different groups of ingredients (oil, salt and pepper not shown). I like to have everything already measured and ready to go, don’t you? First you’ll be getting your cauliflower “rice” ready. I don’t normally like this kind of “rice” but with this recipe, it tasted scrumptious. 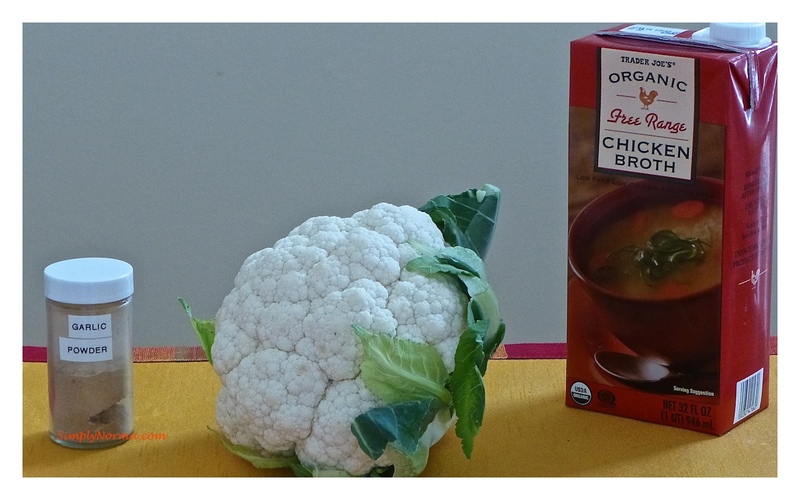 I was able to find a small cauliflower that was just enough to feed two people (strange, isn’t it, as normally cauliflowers are so large). 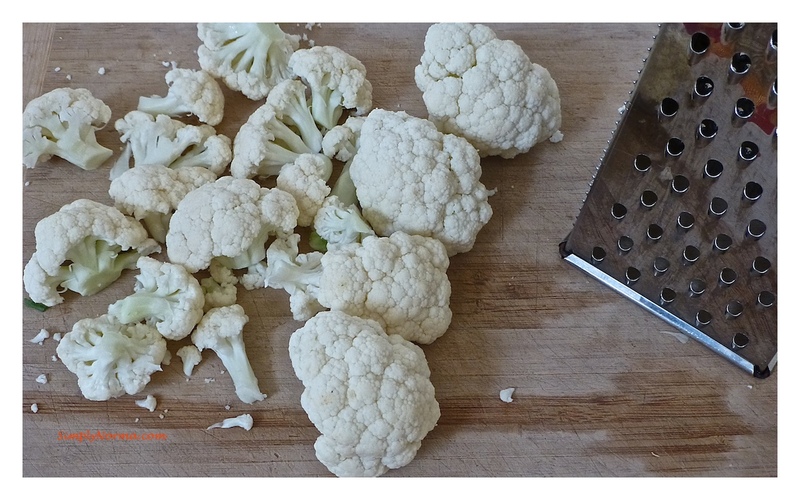 First you’ll prepare the cauliflower by washing it then removing the green leaves. You should have smaller pieces now. Next you’ll be grating the cauliflower. It will look like this (I didn’t worry too much about making sure all the pieces were the same size). Next you’ll be putting all of the cauliflower ingredients (cauliflower, chicken broth, garlic powder, salt) in a medium sized pot. 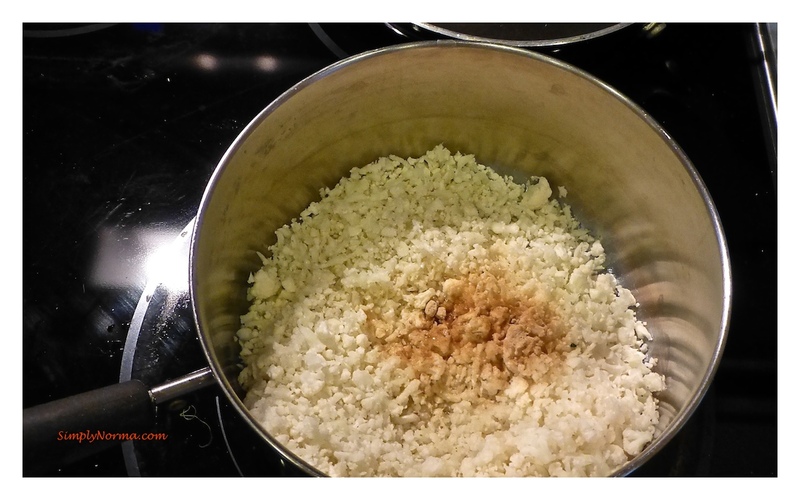 Next you’ll be turning the heat to medium and cooking the cauliflower “rice” for about 10 minutes, covered. Then you’ll be putting that aside. While the “rice” is cooking, get a large dutch oven or pot and put it on medium heat. You’ll be adding coconut oil and then 1 inch pieces of chicken thighs. You’ll be cooking the chicken pieces until they become white on one side then turning them over and cooking them until they are white on the other side making sure they are cooked all the way through. 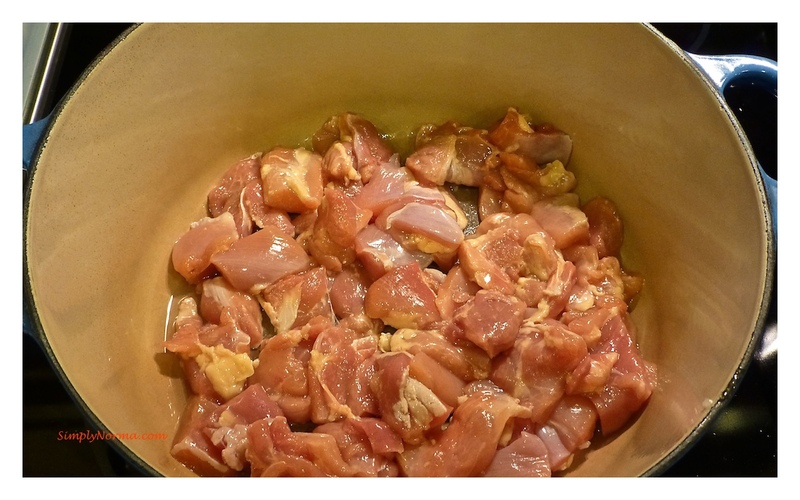 Then, remove the chicken pieces from the pot and set them aside. Put the heat to your pot on low now. Next you’ll be adding the chopped onions and the garlic to the pot. Cook until the onions are clear. 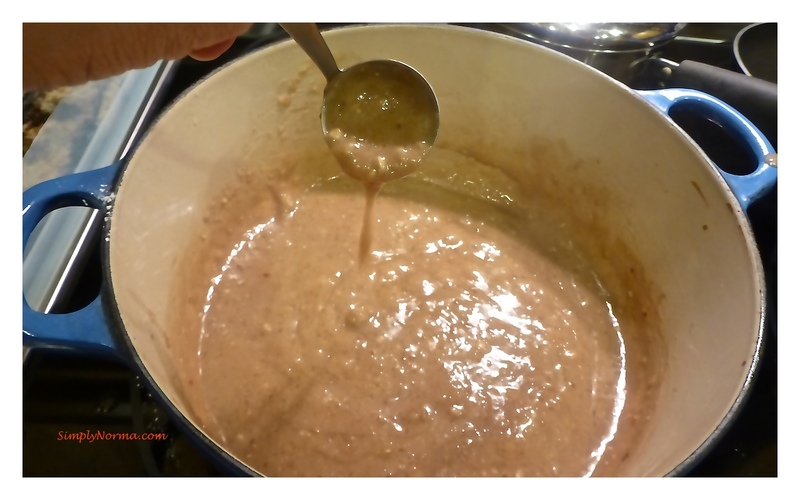 After adding the rest of the ingredients, your sauce will look like this — it should be somewhat thick but pourable. 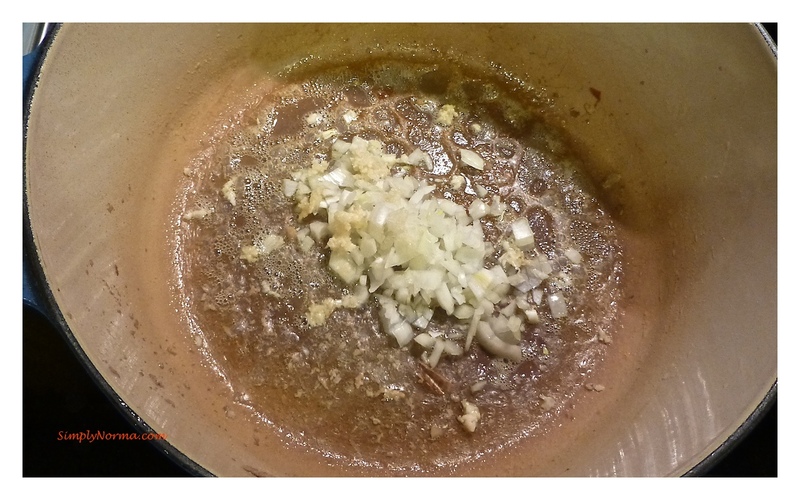 After the sauce is ready, add the chicken pieces back to the pot with the sauce in it. Yeah, I know — it doesn’t look too scrumptious but I guarantee you, this was absolutely delicious. 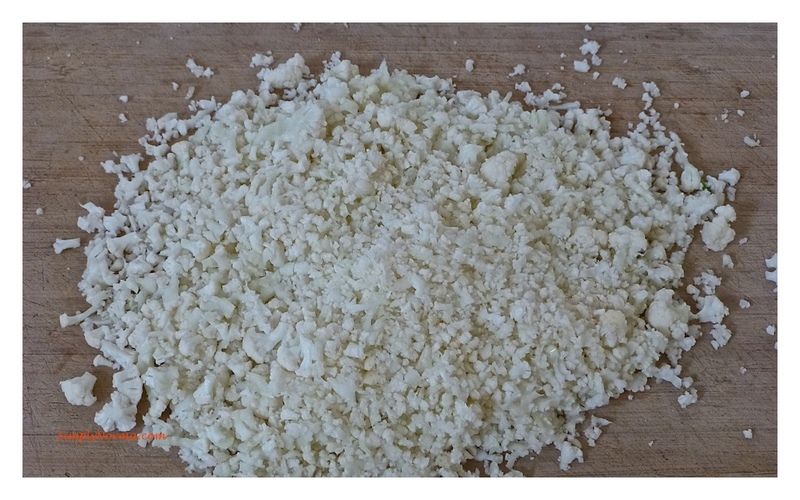 Grate the cauliflower florets into small pieces. In a medium saucepan over medium low heat, add the cauliflower, chicken broth, garlic powder and salt to the pan, stir then cover to let it steam for about 10 minutes. In a large dutch oven or pot, add 2 tablespoons of coconut oil. When oil is hot, add the chicken pieces to the pan. 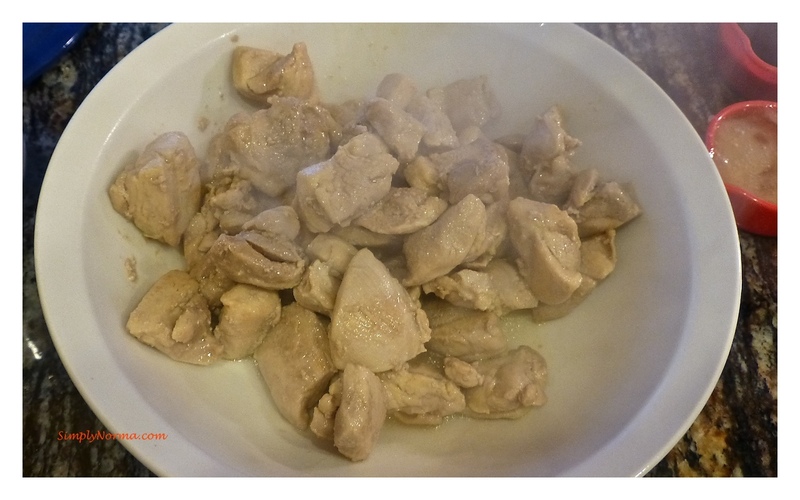 Once the chicken begins to turn white on one side, flip the pieces over to cook the other side. Make sure the chicken is cooked through then remove the chicken pieces and put them on a plate while you make the sauce. Lower the heat to the pot (medium low) then add 2 more tablespoons of oil to it. 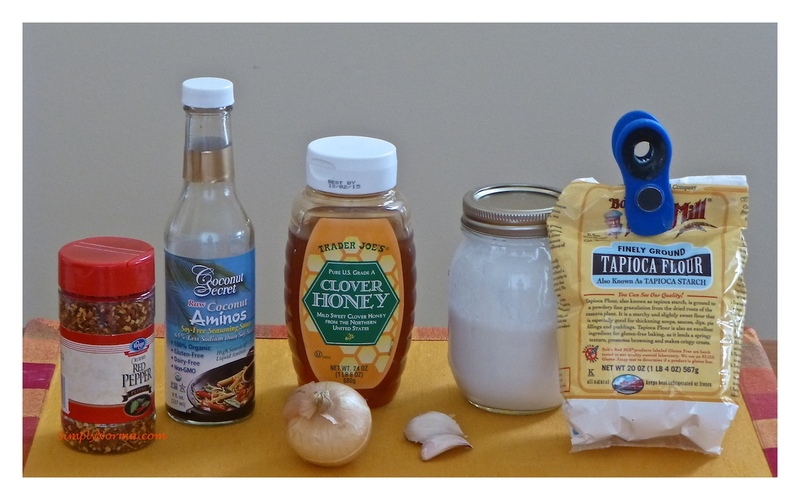 When the onion becomes clear, add the coconut milk, honey, coconut aminos, red pepper flakes and salt. Whisk it all together and let it come to a low boil then reduce the heat to low. 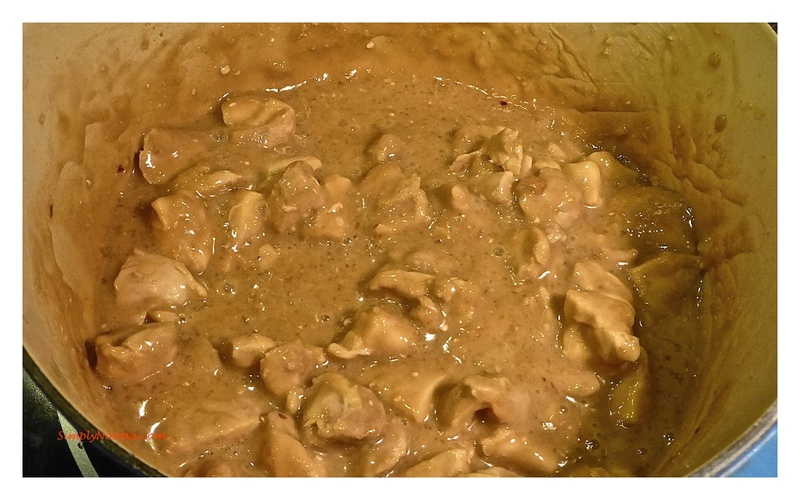 Once the mixture thickens, add the chicken to the pan with the sauce and stir it all together to coat the chicken. Let this cook through for a couple minutes to make sure your chicken is warm again. 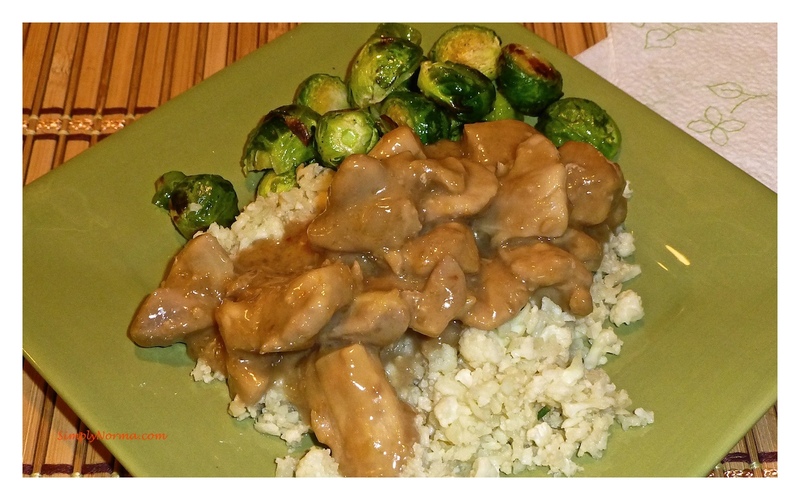 I served the Coconut Honey Chicken with the cauliflower “rice” and Paleo Crispy Brussel Sprouts. Yum! This will go on my “favorites” list. For a list of recipes by category, click here.